Alex Province gives cauliflower the Mexican street corn-treatment in this fun recipe idea. As Alex puts it, the thing that makes Mexican street corn Mexican street corn is the sauce. That sauce is one part mayonnaise to one part Mexican crema. 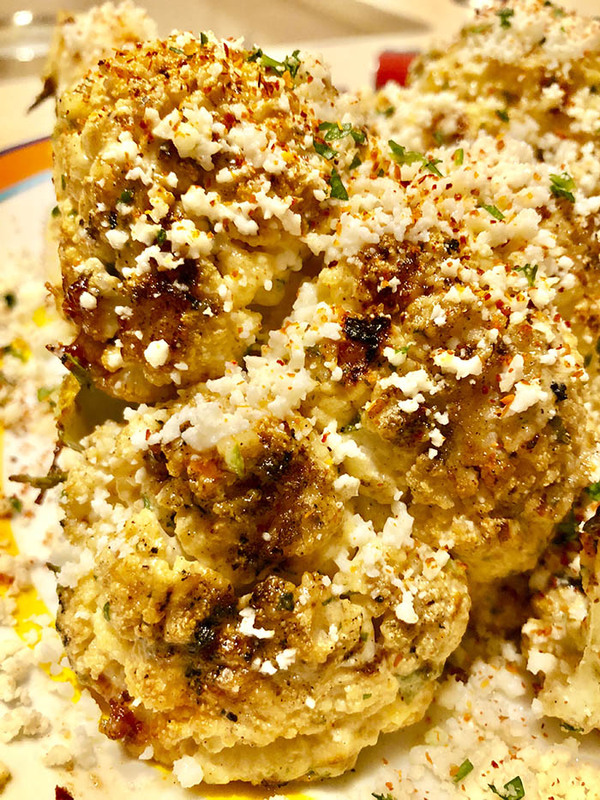 Add the crumbly feta-like Mexican cheese, cojita, and you’ve got the basic white sauce you’ll need to coat your cauliflower. You can use the sauce to coat any vegetable, really. Alex pulled the leaves off and washed a head of cauliflower. Then he cut the head of cauliflower into quarters, carefully so the florets remained intact. Alex put the quarters on the grill and roasted them over medium heat for about 20 minutes. Once the cauliflower quarters were soft and cooked through, Alex basted the cauliflower with the white Mexican sauce (he schmeared the sauce all over). He put the quarters back on the grill for an additional minute to warm the sauce a bit and get things melty and gorgeous. As a final step, Alex sprinkled on more cojita cheese, finely chopped cilantro, and the spicy, limey Mexican spice tajin. Tajin is basically dehydrated lime, salt, and chili powder. If you don’t stock all of these ingredients in your pantry, feel free to substitute sour cream for the crema, feta or parmesan for the cojita, lime zest and salt for the tajin, or add a squeeze of sriracha, chili powder, or paprika to give the cauliflower a little heat. Turn the dial up or down. Your choice.